The device needs to be carefully calibrated during first time use and when the battery is replaced. The device will always prompt you about it when it is needed. Keep the device level, do not tilt it in any directions. 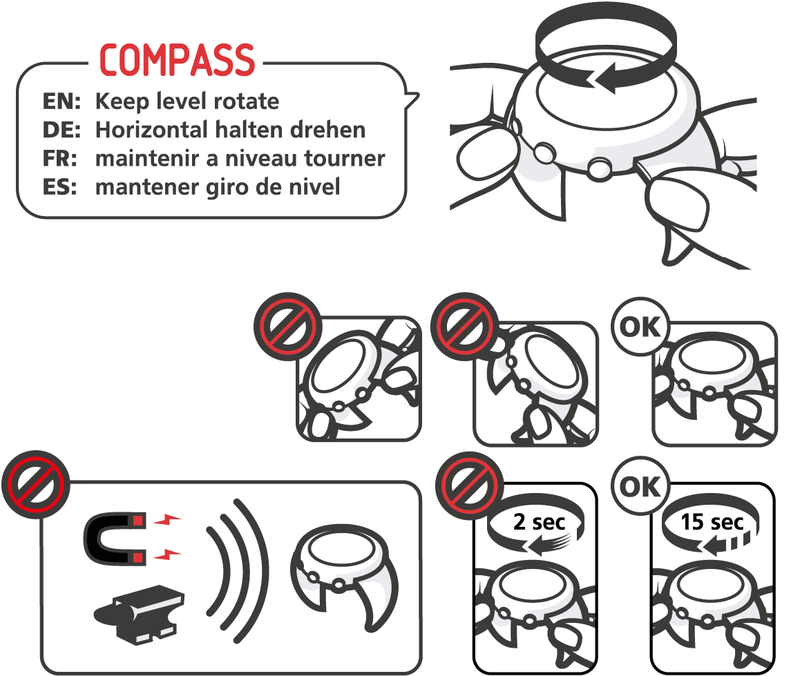 Slowly rotate the device clockwise (around 15 seconds per round) until the compass is activated. If you notice deviations in the compass, you can recalibrate it by keeping it level and rotating it slowly clockwise 5-10 times while in compass mode. Re-calibrate the compass before each use for best possible accuracy. The declination value appears on most maps. The location of magnetic North changes yearly, so the most accurate and up-to-date declination value can be obtained from the internet (for example the National Geophysical Data Center for the USA). Turn the declination off or choose W (west) or E (east). Set the declination value with + and - Light.